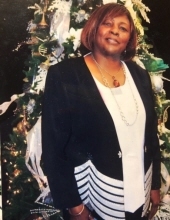 Mrs. Annie Louise Mitchell Luckett Jackson, 68, of North Little Rock, AR departed this life on Monday, March 25, 2019. She was born on February 11, 1951 in Jonestown, MS to the late Nessie Mitchell and Carrie C. Splunge. Annie was the third of eleven children. She accepted Jesus as her Lord and Savior on December 18, 1980 at Lakeview COGIC in Lakeview, AR. Annie attended C.V. White High School and later in life obtained her GED. She gained employment through Walmart in which she held various positions. Annie was joined in Holy Matrimony to the late Coleman Luckett, Sr. To this union eleven (11) children were born. On September 20, 1988 Annie was remarried to Elder Sylvester Lee Jackson III. To this union three (3) children were born. Annie is preceded in death by husbands Coleman Luckett, Sr. and Elder Sylvester Lee Jackson III; one son Patrick Luckett; three brothers Lloyd Mitchell, David Mitchell and Nesby Mitchell; and one brother-in-law Michael Corbin. Annie leaves to cherish her loving memories thirteen beautiful children Coleman II (Anetrice) Luckett of Aurora, IL; Landrix (Dena) Luckett of Oklahoma; Patrice (Gregory) Luckett, Tony Luckett, and Michael (Alexandria) Luckett, all of Texas; Tavaris Luckett and Kary (Jessica) Luckett, both of Benton, AR; John Luckett of Tucker, AR; Steven (Jennifer) Luckett and Nicole Luckett, both of Little Rock, AR; Latoya (Antoine) Thomas of Little Rock, AR; Brittany (Nathaniel) Hardimon of Conway, Ar and Sylvester Lee (Skye) Jackson III of Camden, AR; Five sisters Shellie (Dwight) Edmond of Conway, Ar; Glory (William) Ewing of West Helena, AR; Debra (Herman) Golida of Conway, AR; Brenda Mitchell of Greenbrier, AR and Yvonne Corbin of West Helena, AR; Two brothers Terry Mitchell of West Helena, AR and Hubert (Gail) Mitchell of Forrest City, AR; 40 grandchildren; 8 great grandchildren and a host of sister and brother in laws, nieces, nephews, other relatives and friends. Funeral services will be held 11:00 am, Saturday, April 6, 2019 at Zion Temple Church of God in Christ, 1272 Sutton Street, Conway, Ar. Visitation 5:00 pm – 7:00 pm, Friday, April 5, 2019 at the funeral home. Interment Robinson Cemetery in Conway, Ar. To send flowers or a remembrance gift to the family of Annie Jackson, please visit our Tribute Store. "Email Address" would like to share the life celebration of Annie Jackson. Click on the "link" to go to share a favorite memory or leave a condolence message for the family.